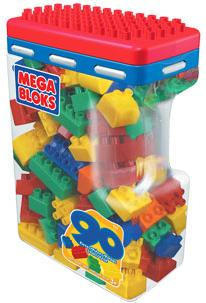 Size (inches): 3.94" X 3.94" X 7.87"
The Mega Bloks Preschool line, can enhance your child's comprehension, language and memory skills while having fun learning and building. The Mega Blok's award winning toys such as My Teaching Piano and Transforming Timmy enriches your child's imagination and play experience with various vehicle and boat assortments that are easy for small hands to construct. Let their imaginations run wild with this assortment of 90 blocks. Limitless possibilities and hours of construction fun combine in one portable package. 90 pieces that are great for little hands!